Growing where we are planted! Welcome to Faith of Our Fathers LCMS website. Please take a few minutes to look around and scroll down each page so you don't miss anything. Then come join us to hear the Word of God each Sunday at 9:00 a.m. in a traditional liturgy with Communion. Everyone who worships with us is greeted with a friendly welcome. You will not be lost in a crowd. To find the Readings and notices from last Sunday's bulletin, click the "Info Center" tab. Faith of Our Fathers is a small to medium size growing congregation located in Roca, Nebraska, just minutes south of Lincoln and northwest of Hickman. Our focus is on the truth that salvation comes only from the belief that Jesus Christ died and rose to forgive our sins. Our goal to remain true to scripture. 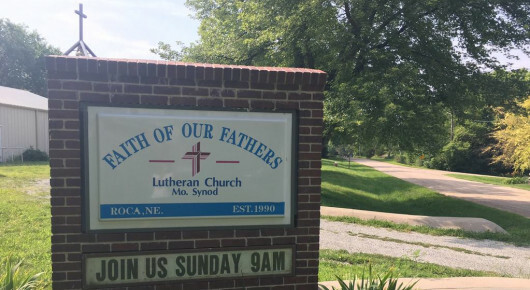 Faith of Our Fathers became a congregation of the Lutheran Church, Missouri Synod, on May 6, 1995. As such, we share the belief that the Bible is the true Word of God. We are blessed to be made up of individuals and families that genuinely care for each other. We like to call ourselves a TRUE CHURCH FAMILY who enjoy fellowship and support from one another as we share Christ's love. Visitors are always welcome! Won't you join in worship on Sunday?